Attached is an article I wrote for The Taylor Association. Please feel free to post this to the Association website. Although this article is copyrighted, you have my permission to re-publish it, and members have permission to quote from it. My grandmother, Helen Taylor Condie, was the last member of a branch of the family descended from colonial settler James Taylor I, who grew to prominence as a Tidewater Virginia landowner in the late 17th century. Much has been written about James Taylor I and his descendants over the past hundred years or so, yet most accounts stop well short—at least with any detail—of my grandmother’s particular branch. The purpose of this article is to add some missing detail to this branch of the Taylor family, beginning with Helen’s grandfather, Jesse. Beyond whatever value there may be in expanding knowledge of the Taylor family genealogy, the stories of the lives of these three generations are interesting in their own right and deserve to be preserved. Jesse Taylor was born 2 January 1828, in Kentucky (where his grandparents and their extended family had migrated from Virginia nearly four decades before), probably on the Taylor farm in Basin Springs, Clark County.1 He was the tenth and youngest child of George Taylor (1779-1827) and his wife Sarah (Sally) Fishback (1787-1846), and the grandson of Jonathan Taylor (1742-1803) and Ann Berry (1749-1809). Jesse Taylor never knew his father, who had died less than five months before his birth, and he grew up in a large family headed by his widowed mother. Jesse had inherited a small parcel of land from his father, which he sold before he reached adulthood to his brother Robert, the funds held in trust until he turned 21.3 Upon reaching his majority, Jesse collected the proceeds from the sale of this land, but may have found it difficult to compete with dozens of siblings, cousins, and neighbors for available farmland in the area where he was raised. So, just after his 21st birthday Jesse moved west to join his brother George on his farm near Springfield in Sangamon County, Illinois. For several years Jesse worked for George, living with him, his wife Louisa, and their young son John.4 George Taylor’s family appears to be only one of several related families to settle in this area at the time, many of whom remained there for generations. Not long after their marriage, Jesse and Eliza left the security of family and friends, and moved 300 miles west to Independence in Jackson County, Missouri. The incentive for settling in western Missouri—which at the time was at the extreme end of what easterners considered civilization—had to be that Independence had become the favored “jumping off point” for the Great Migration West of the mid-19th century. In the late 1820s the town’s location made it the preferred starting point for traders making the trip westward on the Santa Fe Trail, and by the 1840s Independence merchants were outfitting thousands of pioneers heading out on the Oregon and California Trails. A landing on the Missouri River three miles north of Independence provided access by steamboat for both supplies and people from St. Louis and points downriver. 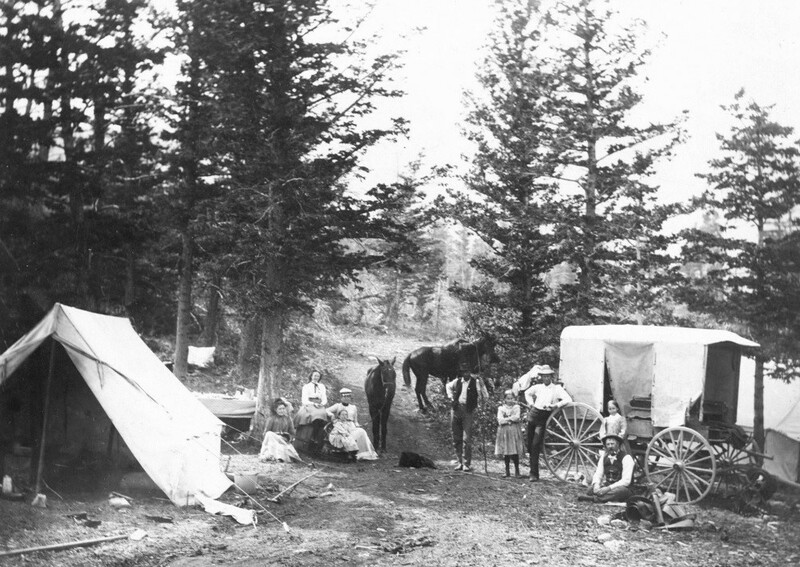 Most of the pioneers heading west by 1855 arrived in Independence after having sold their farms, household goods, and livestock, and they used the cash from the sale of their former possessions to buy one or two wagons, teams of horses, mules, or oxen, and the food, tools, and other supplies necessary to survive the five- to six-month trip west. The lure of this ready market convinced Jesse Taylor to purchase a farm near town where he raised horses and mules. Although oxen were the preferred choice for pulling pioneer wagons, a quarter to a half of all wagons on the Oregon and California trails were pulled by teams of horses or mules. 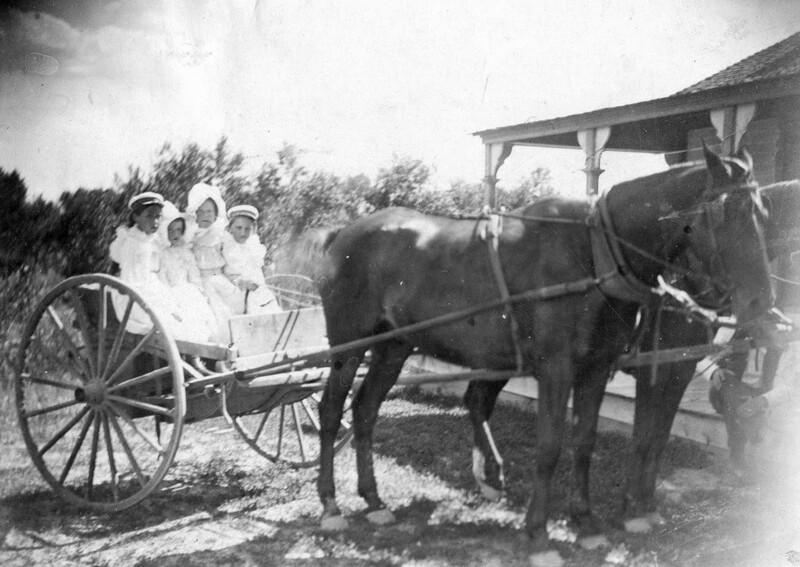 Oxen made the strongest wagon teams and were easier to handle than mules, but horses and mules were preferred by those who favored speed over strength. One biographic sketch of Jesse Taylor states that the horses and mules raised on his Independence farm were sold to eastern and southern markets, but it seems probable that his initial market, at least, was for wagon trains of pioneer families heading west.9 The 1860 US census lists Jesse and Eliza Taylor living on their Independence farm with real estate valued at $3,200, personal property valued at $2,000, and two slaves. Notwithstanding Independence’s favorable site as an outfitting and trading center, the Taylors’ timing in moving to western Missouri could almost not have been worse. Controversy surrounding the Kansas-Nebraska Act of 1854 erupted in widespread violence throughout Jackson County as Missourians in favor of slavery battled anti-slavery Kansans beginning in 1855. One consequence of these protracted and bloody feuds was that the flood of western migration slowed to a trickle, and Independence’s outfitting trade dried up with it. Consequently, the Taylor family remained there only a few years. From western Missouri Jesse Taylor took his family to Denver, Colorado, where he formed a business partnership with a Colonel White. Taylor and White sold groceries and shipped freight by bull team from Denver west to Salt Lake City—a rugged 550-mile trip across the Rockies on primitive trails.10 The move west from Independence proved fortunate not only for avoiding Missouri’s violence over slavery but also for escaping the bloodshed of the Civil War when Confederate troops captured the town of Independence in August 1862, and Union troops recaptured it in a two-day battle in October 1864. Independence reportedly was never able to recover its former prosperity after the local destruction caused by the war. The ST Ranch began operation in earnest in 1879, when the partners purchased a herd of 2,000 head of Hereford cattle in Beaverhead County, and moved them north to the ST in a classic cattle drive.18 Within a few years, the ranch’s cattle herd had expanded to between 15,000 and 25,000 head.19 Like many western ranches, the ST found that an abbreviated ranch name made up of two or three letters was convenient, in part because this allowed for the creation of an easily recognizable brand for their livestock. The Sands and Taylor Ranch used a simple ST as its brand. The State of Montana still maintains a livestock brand registry to assure that all brands are unique and protected from unsanctioned use. iii. Jesse F. Taylor Jr. Jesse. 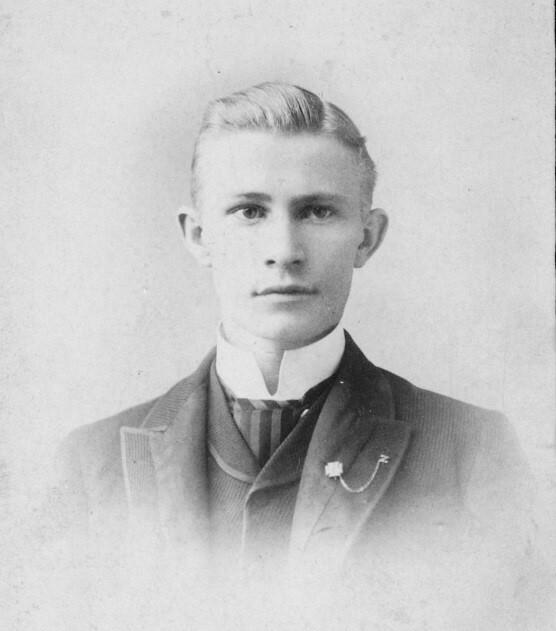 Taylor Jr. was born 3 December 1872, in Helena.23 He likely returned to Montana from his grandparents’ Illinois home later than his older brother Litchfield, and attended at least some schooling in Choteau. After completing his secondary schooling, Jesse Jr. graduated from Washington and Lee University in Lexington, Virginia. In 1891 he came back to Choteau to resume his ranching career.24 Within a few years he was managing the Burke Ranch—part of the Taylor complex—in Conrad, Montana. Some internet-based family genealogies list two other children for Jesse and Eliza Taylor: a son William, born about 1866 in Montana, and a daughter Nettie, born about 1864 in Illinois. The evidence for both of these children is their appearance in 1880 US Censuses. 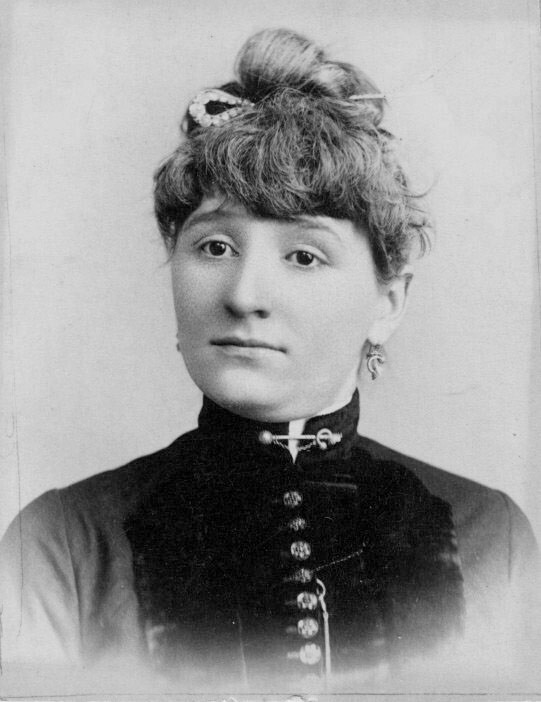 Nettie Taylor, age 16, is listed as the daughter of Jesse and Eliza Taylor (both shown living in 1880) in their Litchfield, Montgomery County, Illinois, home. Nettie’s birthplace is given as Illinois, and her parents’ birthplaces are both shown as Indiana. Coincidental names aside, this is probably not the same Jesse and Eliza Taylor. Eliza Van Deren, wife of Jesse Fishback Taylor, had been dead for a half-dozen years by 1880, and Jesse had been living in Montana for 15 years. Neither was born in Indiana. It seems hard to believe, however, that there is not some relationship between these similarly named families. Nettie’s home in Litchfield is only about 25 miles south of Chatham where Jesse F. Taylor and Eliza Van Deren and their families had lived at the time of their marriage. And, of course Jesse F. and Eliza named their second son Litchfield. The purported son William appears in the 1880 census in the household of Jesse F. Taylor in Choteau County, Montana, together with his brothers Wallace and Jesse Jr. From other census data of the same year, we have evidence that Jesse F. Taylor Jr. and Litchfield Taylor were living with their maternal grandparents in Sangamon County, Illinois, and this would seem to fit with the circumstances. A clue to the possible fallacy of William’s existence is the fact that the census enumeration for the 1880 household of Jesse F. Taylor shows the names of sons Jesse and William in parentheses—a rather unusual method of name entry which may have meant that those named were not actually present in the household at the time. Also suspicious is the fact that the age given for son Jesse is 16, when he was in fact only eight years old at the time the census was taken in June, 1880. It is probable that neither Jesse Sr. nor Wallace Taylor gave the information in the 1880 census to the enumerator personally. More likely it came from one of the several other residents of the ranch at the time, very possibly the 19-year-old “Hired Man” listed in the census as George W. Taylor (see The “Chinamen” in the next generation). The conclusion assumed here is that Nettie is not a child of Jesse F. Taylor and his wife Eliza Van Deren, and that William is actually Litchfield. Cyrus Wallace Taylor, the namesake of his mother’s father, was born 6 December 1856, in Independence, Jackson County, Missouri.1 Throughout his life he used Wallace as his preferred given name, although he followed the popular form of the late 1800s in frequently listing and signing his name as C. W. Taylor. Wallace Taylor lived nearly all his life on the frontier, as his parents migrated from his birthplace in western Missouri to Colorado and then Montana. When he was just a month shy of his eighteenth birthday, his mother died, and his two younger brothers were sent east to live with their grandparents. Wallace had completed the schooling available to him in Helena at the time of his mother’s death, so he took a job as a type-setter (called a compositor in those days) on the Helena Herald. He left that job after two years to take a similar one with the Helena Independent, and worked there for several more years. Wallace Taylor married Margaret Muriel (Maggie) Jackson, daughter of John Jackson and Agnes Nelson, 24 August 1887 in Choteau, Montana.3 John and Agnes were both natives of Scotland; he was born there about 1828, she about two years later.4 The couple emigrated to Canada—a common occurrence for Scots in the 1800s—around the time of their marriage, reported to be about 1855. In addition to Maggie, the Jacksons had at least five other children: William (born about 1856 in Canada), Agnes (born about 1858 in Canada), Mary (born about 1860 in Canada), Hugh (born about 1862 in Canada), and John Jr. (born about 1870 in Illinois). Around 1867 the Jackson family migrated south to farm land in northeastern Illinois. Maggie may have been born there about that time, although there is a substantial but inconclusive evidence that she was born in 1861 in Pennsylvania.5 By 1870 the Jacksons had settled in Troy Grove, La Salle County, Illinois, in a community with a high percentage of Scottish immigrants, many of whom may have also moved from Canada. The Jacksons remained in Illinois for at least a decade before John decided to follow silver and gold rushes to Leadville, Colorado, and then to Choteau, Montana. Late in life John ran a well-known hotel and the corner of First and Main Streets in Choteau. 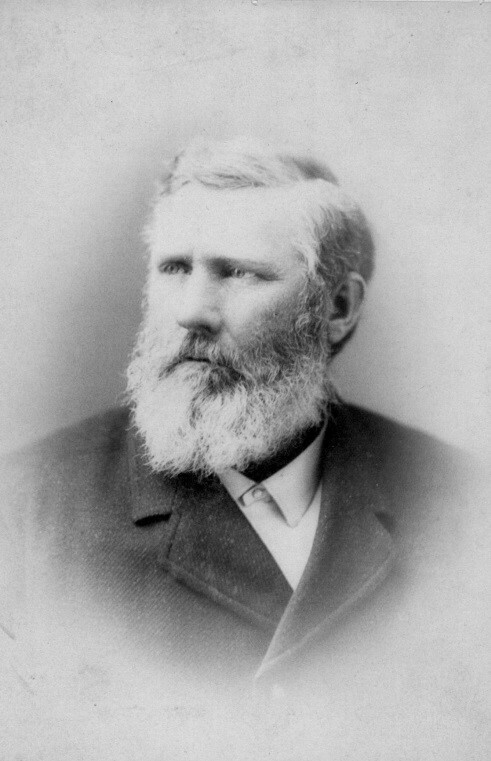 His son John Jr. was the first Justice of the Peace for Choteau Township and ran a saloon in town. Charles Marion Russell, Montana’s famous cowboy artist, was a contemporary of Wallace Taylor, and was well known to the Taylor family and their circle of friends. Russell came to Helena as a teenager, and spent his youth as a hunter and trapper, and later as a cowboy—the role with which he most identified. Although self-taught as an artist, Russell became a master at capturing the action, spirit, and color of the Old West in paintings, drawings, sculpture, and his famous illustrated letters. Charlie Russell’s artwork depicts the real Old West of cowboys and Indians, buffalo hunts and wagon trains, and the spectacular scenery of frontier Montana in the late 19th century. Thankfully, several excellent museums and some beautifully illustrated books have preserved this legacy for those of us in the 21st century. 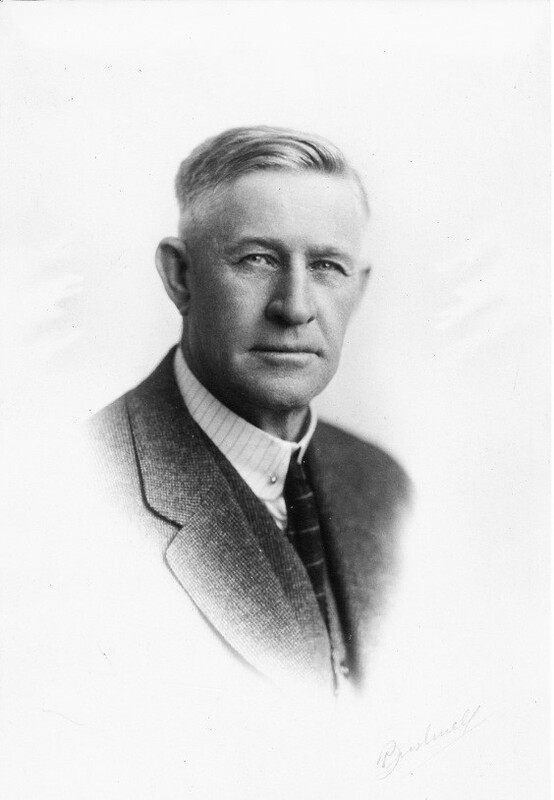 In 1893, the Montana legislature created Teton County from a portion of Chouteau County, and appointed Wallace Taylor to the new county’s first Board of County Commissioners along with Commissioners C. W. Grey and Walter S. Clark. Wallace also served one term as Sheriff of Teton County beginning in 1900, at a time when that part of Montana was still relatively untamed and populated with Blackfoot Indians. i. Margaret (Peggy) Patton Taylor. 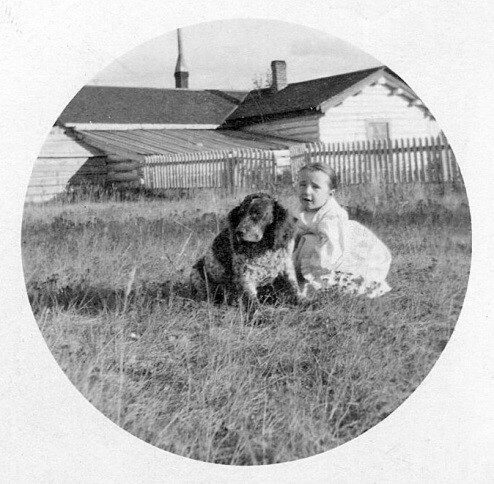 Although Peggy Taylor was a life-long resident of Montana and grew up in Choteau, she appears to have been born in Chicago on 1 June 1888.10 She married John Joseph Hannan., a native of “The Free State of Ireland” as it was listed in 20th-century census records.11 John managed Hannan’s, a men’s clothing store on Central Avenue in Great Falls during the 1930s and ‘40s. ii. Martha Sarah Taylor. Martha was born 17 October 1889, in Choteau.16 After studying at the University of Washington, she married Carrol Meteer Shanks 7 April 1921 at the First Methodist Episcopal Church in Seattle, Washington, upon Carrol’s graduation from the University of Washington.17 Carrol Shanks was born 14 October 1897 in Fairmont, Minnesota.18 He graduated from Columbia University Law School in 1925 in the same class as Supreme Court Justice William O. Douglas, and subsequently practiced law. After a short law career, Carrol joined Prudential Life Insurance Company and became its president in 1946. A decade later he appeared on the cover of Time Magazine.19 Martha and Carrol Shanks lived much of their married life in Montclair, New Jersey. c. Carrol Meteer Shanks, who was born in 1931. Meteer married Hermann Casper (Gus) Schwab III (8 January 1920 – 1 April 2013) about 1955. Gus Schwab was a Yale graduate who served as a lieutenant in France during World War II, and had a long career as a New York investment banker. Meteer and Gus Schwab lived in Manhattan, and Oyster Bay (Long Island), New York.24 Their children included George Schwab and Katherine (Tatine) Kimmick. iv. Helen Mary Taylor [see below]. One interesting aspect of life on the ST Ranch was the role of two Chinese members of the Taylor household, Soo Son and George Washington Taylor. Revolution and extreme poverty in southern China during the mid-1800s convinced thousands of Chinese to make the long and expensive trip to America. 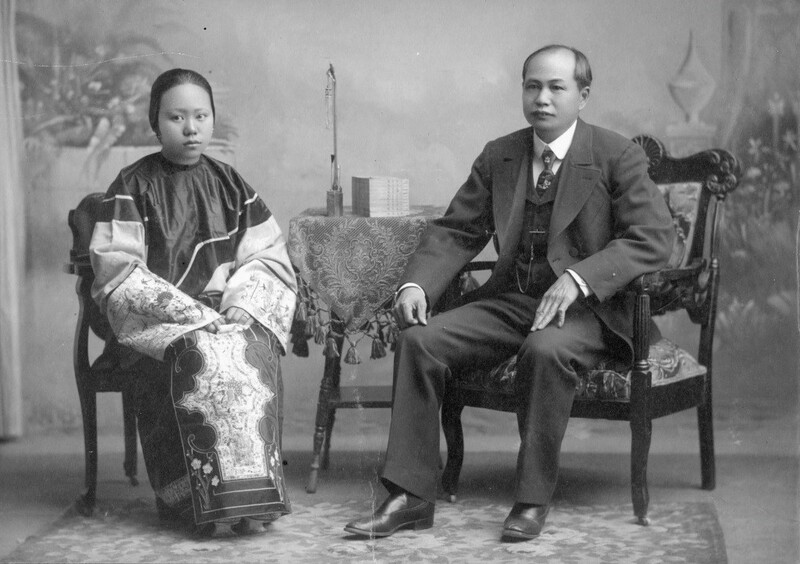 Many Chinese were originally drawn by the stories of easy riches in California– a place commonly referred to as “Gum Shan” (Gold Mountain) in China—and by the late 1800s every former mining town in the West had its bustling Chinatown. Rather than working in the gold fields, large numbers of Chinese found jobs building the transcontinental railroad, but when that work was gone they often took jobs in local laundries and restaurants, or as laborers. By 1870 Montana’s Chinese population had reached a peak of about 2,400. 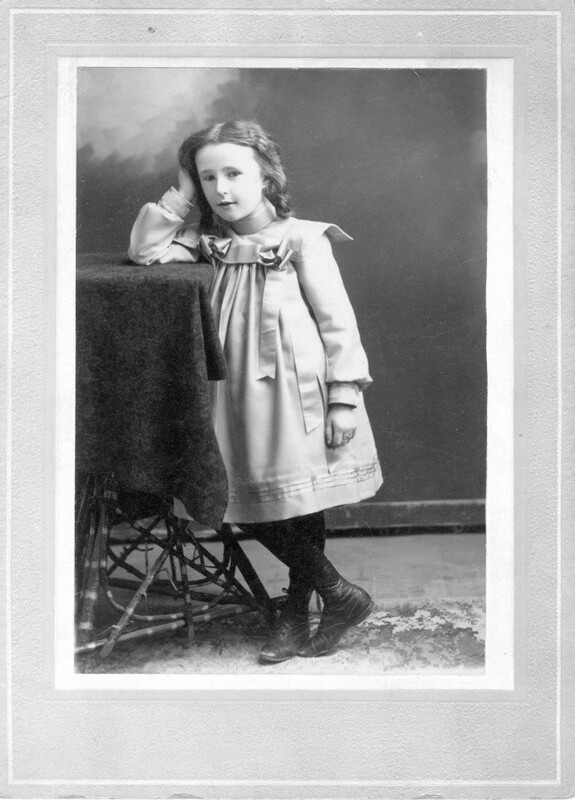 Earl, the son of Robert Edwin Condie and Marietta Hobart Miller, was born 15 May 1891 in Superior, Wisconsin. 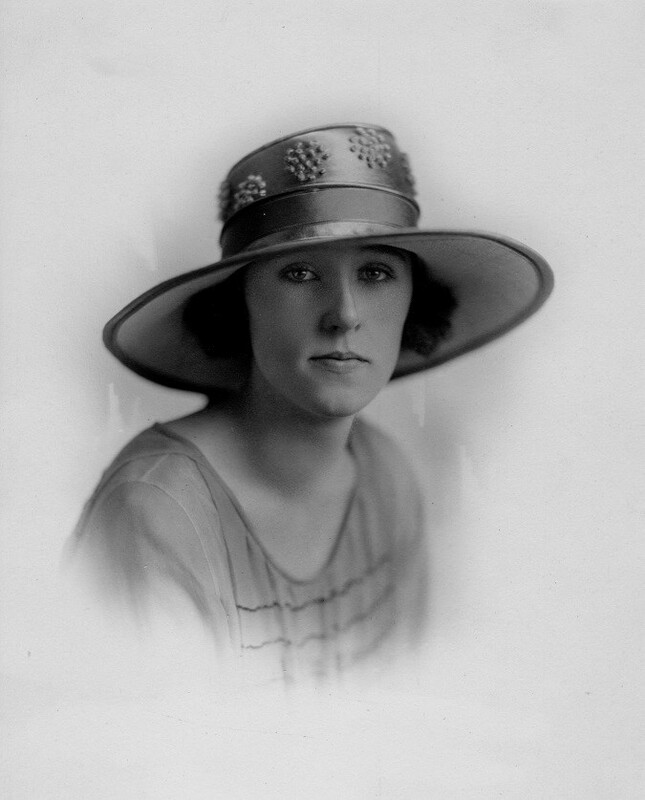 Earl’s Condie relatives, like Helen’s mother’s family, were originally natives of Scotland. A large group of Condies, together with other Scots, migrated from Clackmannan to Eastern Ontario, Canada, sometime before 1823, and Earl’s family continued south to farm in Wisconsin around 1865. In the 1920s and ‘30s, Helen and Earl lived in Seattle’s Ravenna and Queen Anne neighborhoods and in Portland, Oregon, moving back and forth as Earl’s jobs dictated.5 Early in World War II they relocated to Oakland, California, and later to San Francisco, Los Angeles, Sunnyvale, and Los Altos during Earl’s post-war career. In retirement, their last home in was in Palm Desert, California. Helen Taylor was a member of the generation that saw greater technological change than probably any other before it. She began life in America’s Old West, where her father habitually carried a “six-gun” in case of an encounter with cattle rustlers or outlaws. In her early childhood, local transportation was by horse and wagon, but she lived to see the development of the automobile, she travelled to Europe by jet airliner, and was a witness to moon landings by American astronauts. During her lifetime the tools of warfare moved from the bolt-action rifles and horse-drawn artillery of World War I to sophisticated nuclear weapons during the Cold War of the 1950s, ‘60s and ‘70s. At the beginning of her life photographs were printed on tin or glass; by her death they were projected on color television screens in nearly every home. Helen and her family also survived the Great Depression which, because Earl remained steadily employed in the food industry, did not affect them as much as it did the average American family. Their daughter Claire would later recall that with two cars in the family, a maid, and spacious homes, she had hardly realized that there was a Depression. Those who knew her in her 20s and 30s described Helen as the perfect flapper of the Roaring ‘20s era. She had an outgoing and fun-loving personality that fit with the flame-red hair she maintained throughout her life. 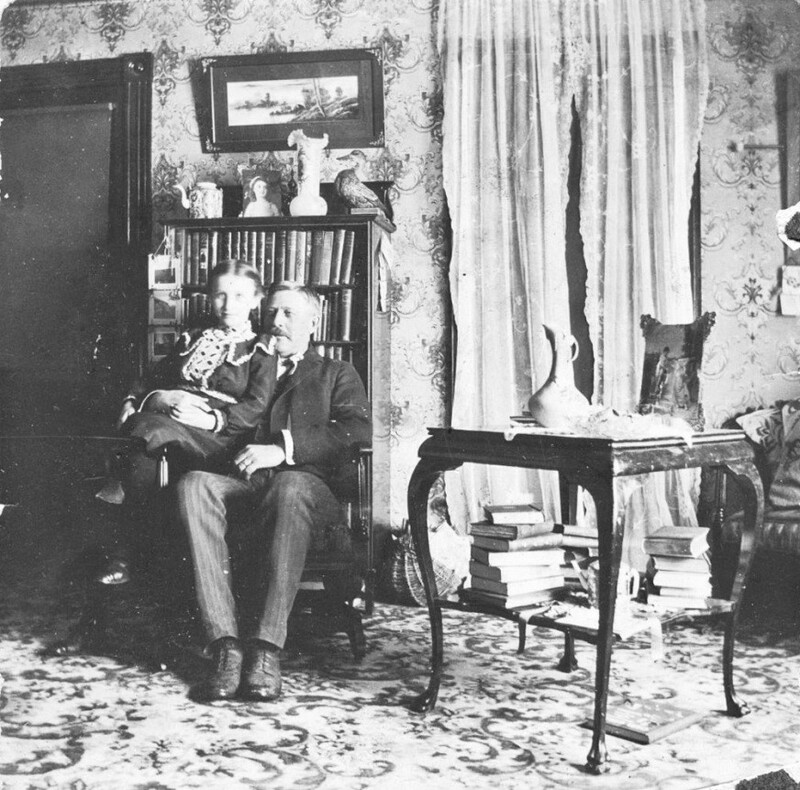 Jesse F. Taylor, his wife Eliza Van Deren Taylor, and their son Cyrus Wallace Taylor, about 1864. Wallace Taylor’s sidearm of choice was a Colt Single Action Army revolver that he carried daily when working on the ST Ranch or performing his duties as county sheriff. The model 1873 Colt revolver—nicknamed the “Peacemaker”—was the most popular handgun of those on both sides of the law in the Old West. Western legends Wyatt Earp, Doc Holliday, Bat Masterson and the Dalton Gang all carried Colt Single Action Army revolvers, as did Custer’s 7th Cavalry. 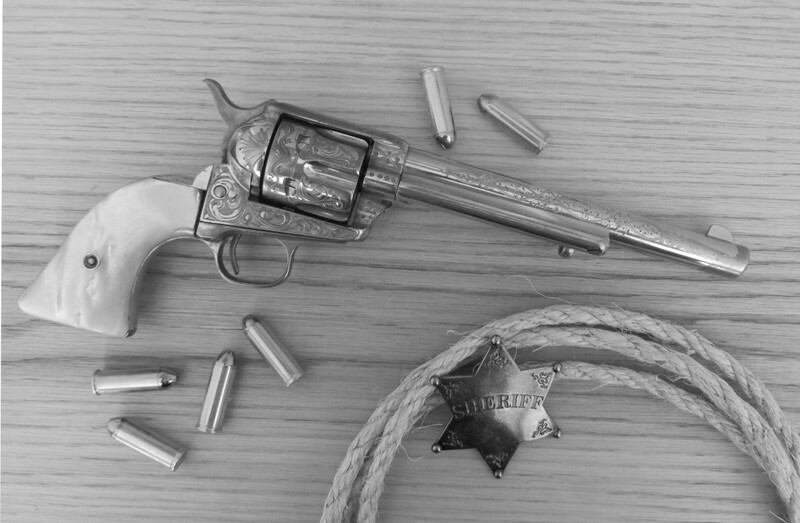 Wallace Taylor’s particular Colt was this nickel-plated, factory engraved model with pearl grips and the lengthy 7 ½-inch barrel. It was produced in early 1882, and chambered for the powerful 45 caliber round, the most popular of the 30 different calibers Colt used for this gun. Helen Taylor believed that Wallace may have received this Colt as a gift. She clearly recalled that her father always removed his revolver when entering the house, and set it on a table just inside the front door. The cardinal rule of the Taylor household was that no one was ever to touch it but Wallace. Willis Miller Kemper, Genealogy of the Fishback Family in America (New York: Thomas M. Taylor, 1914. Reuben Dewitt Fishback, Genealogy of the Fishback Family: The Descendants of Harman Fishback, The Emigrant with Additional Data (Lancaster, PA: Lancaster Press, 1926). C. Holtzclaw, Ancestry and Descendants of the Nassau-Siegen Immigrants to Virginia 1714-1750, Germanna Record No. 5 (Culpeper, VA: The Memorial Foundation of the Germanna Colonies in Virginia, 1964). John W. Wayland, Germanna, Outpost of Adventure 1714-1956, Germanna Record No. 7 (Culpeper, VA: The Memorial Foundation of the Germanna Colonies in Virginia, repr. 1989). The standard reference for the Spotswood’s expedition and the Knights of the Golden Horseshoe is W. W. Scott, A History of Orange County (Richmond, VA: E. Waddey Co., 1907; repr. Baltimore, MD: Clearfield Co., 1974). See Chapters X and XII. 1850 US Census of Illinois, household of G[eorge] W[illiam] Taylor. Kemper, Genealogy of the Fishback Family, 176; and Marcie Van Deren, Descendants of Joh. Bernardus Von Duehren. online family database, Ancestry.com. Marcie Van Deren appears to draw extensively from the family genealogy given in H. S. Van Deren, Van Deren, Genealogy as Compiled by HSV. ms, Nashville. An alternate marriage date of 21 November is given in Jordan Dodd and Liahona Research, comp., Illinois Marriages, 1851-1900, online database (Provo, UT: Ancestry.com Operations) 2005. This may be the date on which the marriage was registered. Some sources give Jesse’s wife as Margaret (Eliza), but Margaret is Eliza’s sister according to Van Deren. David R. Hoffman, personal research papers on the Taylor and Van Deren families, quoting a Van Deren family Bible. Mr. Hoffman is a Van Deren descendant from Harrisburg, Pennsylvania, and has been a long-time correspondent with the author. Hoffman, quoting a Van Deren family Bible. “Benton Avenue Cemetery,” online database, <www.findagrave.com>, 20 April 2014. David R. Hoffman believes that Eliza was born 7 March 1836, citing the Van Deren Bible, but a photo of Eliza Taylor’s gravestone clearly show the inscription reads 7 May 1836 (see Note 11. below). Her place of birth is apparently given in the Van Deren Bible. Charles M. Russell, Good Medicine (Garden City: Garden City Publishing Corp., 1930) 18. Bowen, Progressive Men, 1834. Eliza Taylor is buried with her husband in the Benton Avenue Cemetery. A photo of their combined grave marker is shown at http://www.findagrave.com. 1880 US Census of Sangamon County, Illinois; household of Cyrus W. Vanderan. Kenneth R. Boggs, “Sands and Taylor Ranch” [WPA] Montana Writers Project, Teton County Livestock History (Reel 34), 1940; and Bowen, Progressive Men, 1834. Litchfield Taylor’s middle initial “T” is confirmed in a US Pre-Emption Patent, Certificate No. 4887, dated 21 June 1892, issued to Litchfield at Helena, Montana. The full name “Litchfield T. Taylor” appears six times in this document. Bowen, Progressive Men, 1833; Kemper, Fishback Family, 176 (year only); and Van Deren, Descendants of Joh. Von Duehren. Several sources give Litchfield’s place of death as Fort Steel, British Columbia, but a letter discussing his death quoted Van Deren, Descendants of Joh. Von Duehren, states “Maj. Davenport is in receipt of a letter from Ft. Steele, Wyoming, announcing the death of Litchfield Taylor which occurred on the 12th ins. Deceased was the son of the late Jesse Taylor, and lived for some years in Helena during his boyhood and to a few years ago resided in that state.” Kemper, Fishback Family, 176, gives the year of Litchfield’s death as 1895. “Jesse Taylor, Old Timer and Pioneer Dies in Choteau” unknown Montana newspaper, date unknown, Vol. IV (Copy in custody of the author). Jesse Jr.’s birth date varies between 1871 and 1872 in contemporary documents. The 1880 census is unclear, showing his age as 8 in mid-year, meaning that he could either have been nearly 8 or 8½. His birth date is given as Dec 1871 in 1900 US Census, where he is listed as head of household. At this time, Jesse is the manager of the Burke Ranch, and—as a 28-year-old—is significantly younger than the men he manages, who are also listed in the same census household. Jesse may have wanted to appear as old as possible at this time. He lists birth date as 3 Dec 1872 on his WWI draft registration card, dated 10 Sep 1918, and gives his age as 49 on his marriage certificate in November 1922, indicating birth date of 1872. Teton County History, 288, gives his birthday as 31 December 1871 (Teton County History Committee, Teton County, a History, 1988: The Story of Teton County, Montana, Its Land, Its Infancy, Its People: History of the Area Through the World War II Era (Choteau: Choteau Acantha, 1988). Kemper, Fishback Family, shows a birth year of 1871. Marriage certificate, Ancestry.com, Montana County Marriages 1865-1950, online data base (Provo, UT: Ancestry.com, 2014). Emergency Passport Application of Jessica Shields dated 21 June 1918, (Photocopy), Kathleen René, K. A. Murphy-René Family Tree, online database, Ancestry.com (Provo, UT: Ancestry.com) 15 October 1014. Teton County History Committee, Teton County History, 288. Obituary of Jesse F. Taylor Jr. Photos of Jesse F. and Jessie Taylors’ gravestone at Van Deren, Descendants of Joh. Von Duehren. “Benton Avenue Cemetery” online database. 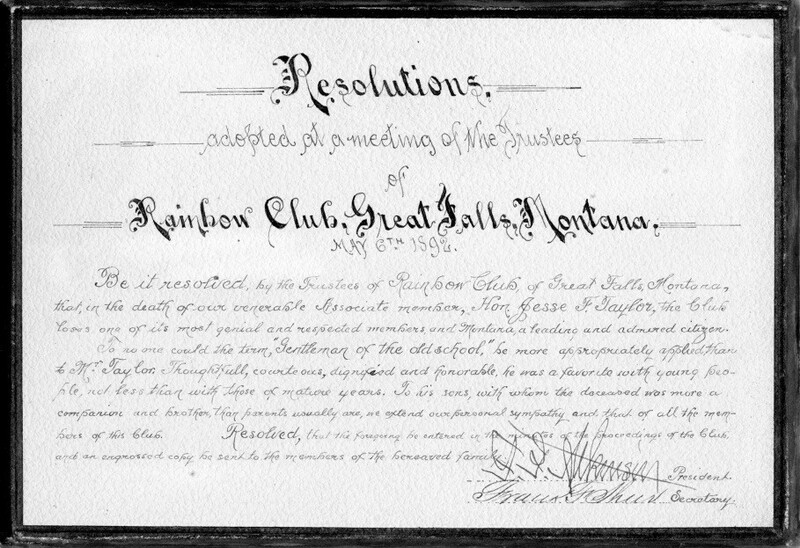 Rainbow Club, Resolutions, adopted at a meeting of the Trustees of Rainbow Club, Great Falls, Montana, May 6th 1892, MS, in custody of Scott Bigbie. “C. Wallace Taylor” unknown Portland (Oregon) newspaper, January 1932. (Copy in custody of the author). “C. Wallace Taylor Dies Saturday At Portland.” The Choteau Acantha (Choteau, MT). 7 January 1932, Vol. XXXVIII, page 1 (Copy in custody of Montana Historical Society Library). Kemper, Fishback Family, 267 (birth year). Kemper believed that Wallace Taylor was born in Illinois. “Pioneer Matron Laid at Rest Here Saturday,” The Choteau Acantha (Choteau, MT). 30 October 1942, Vol. XXXXVI. (Copy in custody of the author). This source incorrectly relates that she was born in Scotland, even though her parents had immigrated to the US five years before her birth. 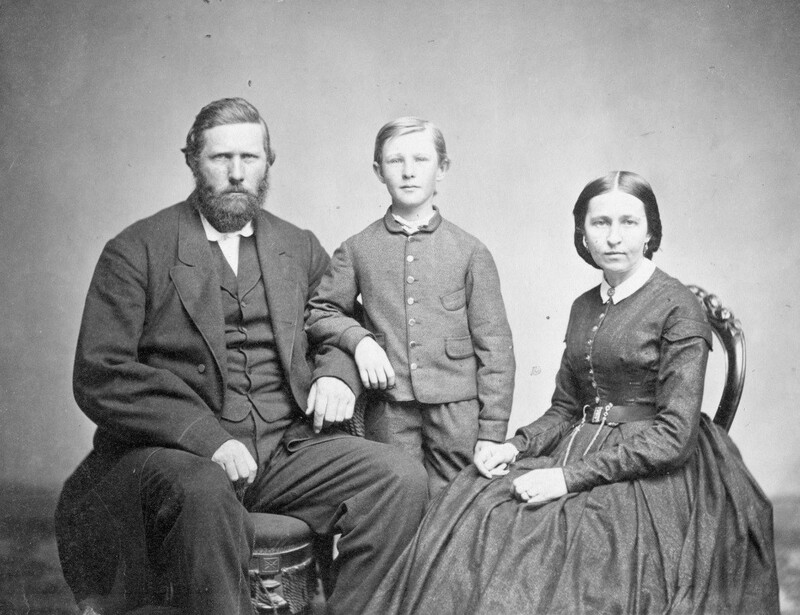 Brigham Young University, Idaho, Special Collections and Family History, online database, <abish.byui.edu/specialcollections> 7 February 2013. Kemper, Fishback Family, 267 (birth year). 1870 and 1880 US Censuses of La Salle County, Illinois, household of John Jackson. The 1870 and 1880 census records for the Jackson household show Maggie Jackson ages 4 and 14 respectively, and as having been born in Illinois. However, as an adult, Maggie Taylor consistently reported that she was born in October 1861, showing her age as 38 in the 1900 census, 48 in the 1910 census, and 58 in the 1920 census. She also reported in these censuses that she was born in Pennsylvania. Maggie Taylor’s death certificate, using information from her daughter Peggy Hannan, lists her birthplace as Pottsville, Pennsylvania, and this information is apparently the source of many later listings of that birthplace for her. The 1930 census, taken when Wallace and Maggie had temporarily returned to Montana, lists Maggie’s age as 66 (i.e., born about 1864), and a birthplace of Illinois. In the 1920 US census, Maggie’s daughter Helen reported that her mother was born in Illinois, but listed her mother’s birthplace as Pennsylvania in the 1930 census. In her application for a Certificate of Delayed Birth Registration in 1947, Helen Taylor states that her mother was born in 1860 in Joliet, Illinois. US Census of Montana, Teton County, Choteau Township, households of C. Wallace Taylor and Maggie Taylor. Obituary of C. Wallace Taylor, and information from Helen Taylor Condie. Ancestry.com, Cook County, Illinois, Birth Certificates Index, 1871-1922, online database (Provo, UT: 2011). Verification of this is contained in the 1900 US Census, in which her birthplace is given (presumably by her mother) as Chicago. In the 1920 and 1930 censuses—after Peggy is married and living with her husband—her birthplace is listed as Illinois. See also Kemper, Fishback Family, 267 (year only). 1930 US Census of Montana, household of John Hannan; and Obituary of Jesse F. Taylor Jr.
Death Certificates of Kathleen and Charles Birk (photocopies), Ancestry.com, Texas, Death Certificates, 1903-1982, online database (Provo, UT: Ancestry.com, 2013). National Cemetery Administration, US Veterans’ Gravesites, ca. 1775-2006, online database (Provo, UT: Ancestry.com, 2006). 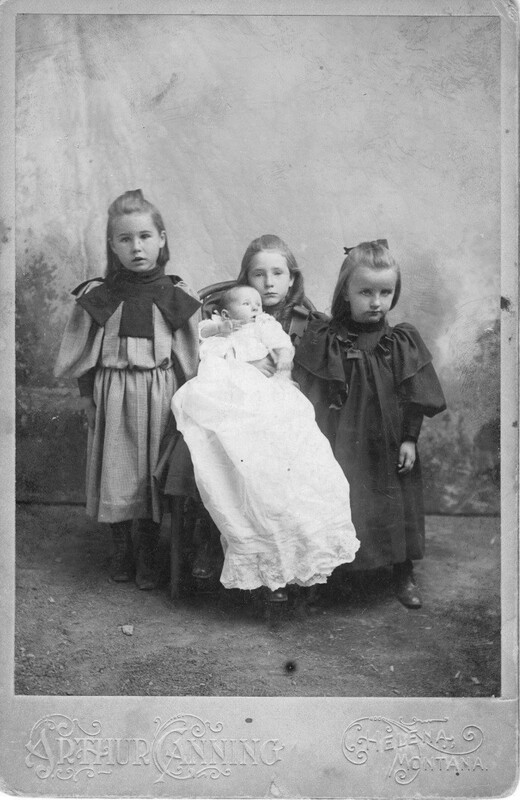 Ancestry.com, Illinois, Deaths and Stillbirths Index, 1916-1947, on-line database, Provo (UT): 2011; and Ancestry.com, Cook County, Illinois, Death Index, 1908-1988, on-line database, Provo (UT): 2008. Birthdate from contemporary handwritten caption on reverse of studio photo of Taylor daughters, dated 23 October 1895. Original marriage announcement from Mr. and Mrs. C. Wallace Taylor in custody of the author. Also see online biographies of Carrol Shanks. Draft registration card for Carrol Shanks, Ancestry.com, US World War I Draft Registration Cards, 1917-1918, online database (Provo, UT: Ancestry.com Operations, 2005). Time magazine issue of 18 March 1957. “Wallace Shanks,” obituary in Houston Chronicle, 4 November 2011; and “Obituary for Wallace Shanks [Jr.],” Seaside Memorial Park and Funeral Home, on-line memorial <www.seasidefuneral.com/obituaries> 1 July 2014. The 1930 US Census of Connecticut lists Margaret at age “1 9/12 Years” in the household of Carrol Shanks. “Kern water leader, former Tejon Ranch president, dies,” The Bakersfield Californian, 8 March 1989. Kentucky Department for Libraries and Archives, Kentucky Birth Marriage and Death Databases: Births 1911-1999; and State of California, California Death Index, 1940-1997, online databases (Provo, UT: Ancestry.com). “Hermann C. Schwab,” The New York Times, 7 April 2013. Birthdate from contemporary handwritten caption on reverse of studio photo of Taylor daughters, dated 23 October 1895.; and photos of Louise Taylor’s grave marker in custody of the author. While the term “Chinamen” may not be accepted as politically correct by everyone in the 21st century, this was what Victorian-era Americans normally called the Chinese (or any Asians, for that matter), with no disrespect intended. Lester H. Loble, The Sands Taylor Ranch of Choteau and the Life and Family of Wallace Taylor, ms (Montana: 1971). (In custody of the Montana Historical Society). Loble, a noted Montana District Judge, spent several summers as a teenager working on the ST Ranch; and Helen Taylor Condie, undated letter (ca. 1972) to the author. Helen Taylor Condie, undated letter (ca. 1972) to the author. Loble, Sands Taylor Ranch; and Helen Taylor Condie, undated letter (ca. 1972) to the author. “Man Dies After Attack.,” article in unknown Portland (Oregon) newspaper, January 1932 (Copy in custody of the author). There is some disagreement among family members as to whether Wallace was visiting his daughter in Portland or he was actually living with her at the time of his death. Most evidence points to the conclusion that Wallace and Maggie Taylor still had a home in Seattle at that time. Obituary of C. Wallace Taylor; and photos of Wallace Taylor’s grave marker taken by the author in Seattle. Certified copy of Death Certificate in custody of the author. Delayed Birth Certificate in custody of the author, and information from Helen Taylor Condie. 2344 North 10th Street. See also the 1910 US Census. Marriage Certificate recorded in King County, Washington; and wedding announcement in undated newspaper clipping from the records of Helen Taylor Condie. (Copy in custody of the author). 6308 23rd Avenue NE, Seattle (1922); 30 Northeast 31st Street, Portland (1930); 28 East 45th Street, Portland (1932); 148 West Highland Drive, Seattle (late 1930s). Certified copy of Birth Certificate in custody of the author. Original Marriage Certificate in custody of the author. Scott Woodson Bigbie, The Descendants of George Bigbie of Virginia, Vol. 1, 2nd ed. (Raleigh, NC: Lulu, 2010). Death Certificate recorded in Orange County, California. Information from Claire Condie Bigbie, a witness to her burial at sea.